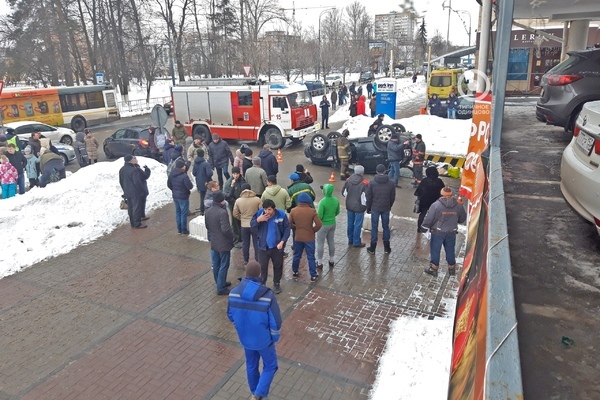 The Land Rover SUV fell from the third layer of the parking lot of a shopping center in Odintsovo near Moscow. There were three people in the car, one with injuries was taken to the hospital, others refused hospitalization, reports on Sunday, January 20, TASS. Video posted on YouTube. The driver told Zvezda that there was not enough room in the parking lot. "There is too narrow, I started to maneuver the car to the right to skip the oncoming car, which drove quickly and then press the pedal, and that's how it happened," she said and added that her husband was in the car sat, who was wounded and darling. The MOE noted that no one else was injured. The building also received no damage.